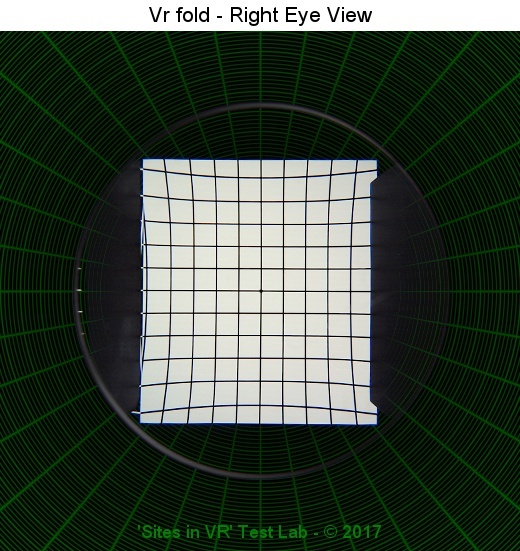 This image shows the right eye view of the Vr fold taken with a calibrated camera at a typical pupil-to-lens distance of 17 millimeters. The no-parallax point of the camera is set at 17 millimeters from the lens surface. The image is shown in fish-eye projection to closely simulate what the eye sees. The test image consists of lines that are straight in fish-eye projection such that any distortion can be contributed to the lens of the viewer. This image shows the field-of-view test from the camera image that is taken at an pupil-to-lens distance of 17 millimeters. The IPD (interpupillary distance) was set to 63.0 millimeters. This is the same as the distance between the optical center of the left and the right lens. The screen size was 5.7 inch. 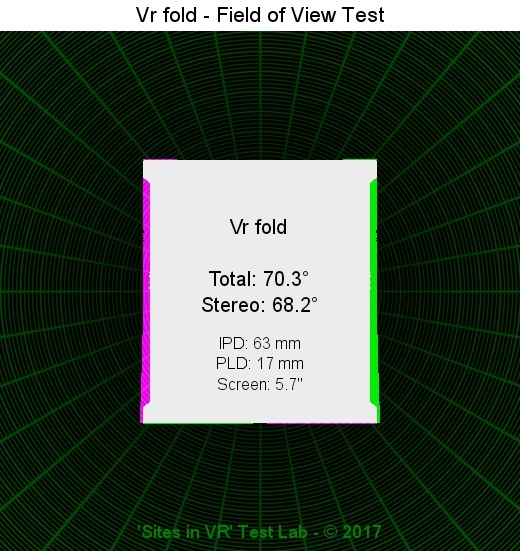 The measured total field of view of Vr fold was 70.3 degrees. The stereoscopic field of view was 68.2 degrees. 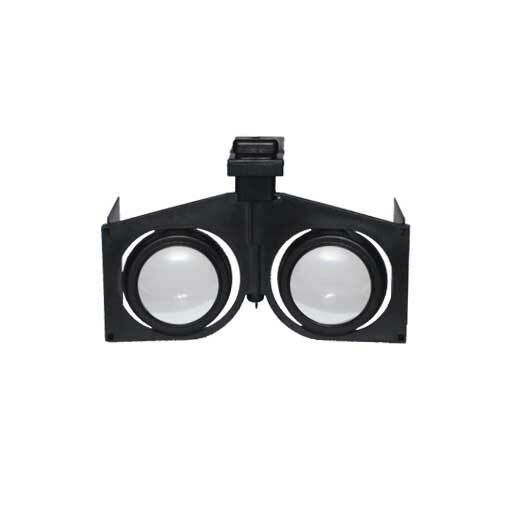 The field-of-view may differ for other eye-to-lens distances or screen sizes! 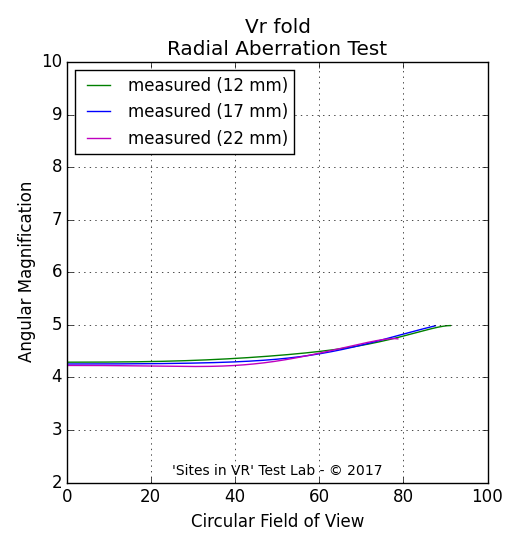 This chart shows the angular magnification of Vr fold at various viewing angles. The higher the magnification, the shorter the distance between the lens and the screen gets. The shorter the distance of the screen, the bigger the screen will look. The software that renders the environment has to know the exact magnification such that the objects are shown at the correct size. 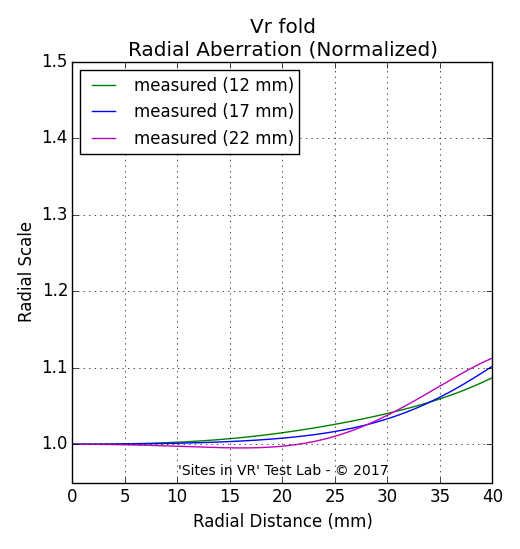 This chart shows the lens distortion of Vr fold at various eye-to-lens distances (eye relief). The distortion curve is used to produce an image that is distorted in the opposite direction such that the final image that the eye sees looks undistorted. 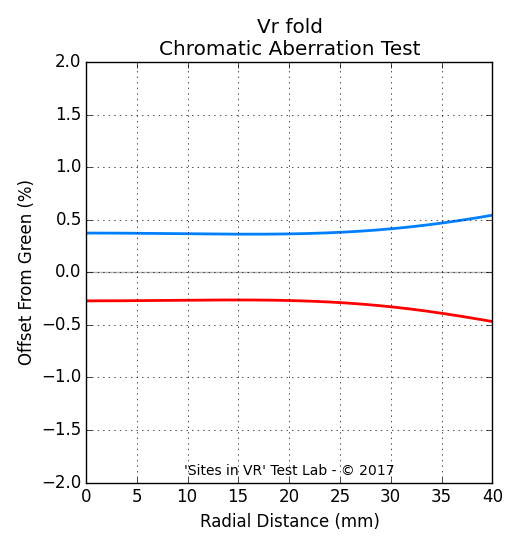 This chart shows the measured color shift of the lenses of Vr fold. 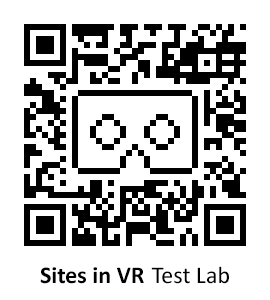 How to set Vr fold as the default viewer using these settings?